Home > Signing Basics > Can Baby Signing Really Help My Child's Development? Parents all over the world seek to find ways of encouraging and enhancing the development of their child as a method of preparing for later life and enabling them with the skills and knowledge needed to become successful as they mature. 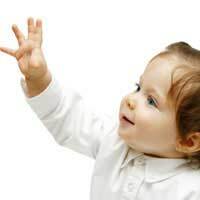 Providing them with the tools needed to promote and advance communication skills is thought to be an excellent way of helping your child and baby signing, otherwise called baby sign language, may offer this opportunity. Baby signing was first recognised and developed in the early years of the 21st century so it is still primarily in its infancy but may have been used in households for much longer. Baby signing or baby sign language, is a way of teaching young children and babies to communicate using gestures and signs. By encouraging this it is thought that cerebral development is enhanced and also that the child is a lot less frustrated as they are able to communicate to those around them of their needs and requests. It may be something extremely simple such as a gesture that shows their carer that they would like a drink or that they are hungry. Such a gesture may be one individual movement or motion but is an easy enough action that can be learned by the child. Initially it is recommended that only your child's basic needs are learned such as nappy change, hunger or thirst but over time both you and your child can learn the signs that depict certain toys or activities that can be enjoyed without disruption or coaxing. Your child will be able to communicate to you what they would, like to do, how they feel and when they want to change the activity, which really is quite an accomplishment if your child is still a baby. It is encouraged that parents and carers action only the most important word in a sentence and show a sign that corresponds with this word.When signs are used, sounds may also be incorporated that correspond with the action. Speech and language therapists generally whole heartedly agree that baby signing is good for a child's development, not only for their cerebral and sensory development but as a way of enhancing the relationship between the child and parent or carer and supporting a harmonious environment in which the child can thrive and the parent or carer enjoy their role. In fact, signing and making associated sounds are being widely used by many nurseries, schools and professions around the country and is thought to encourage interpersonal relationship building and allow your child's confidence to grow. Once bay signing has been learned and the principles and theories have been gained anyone can teach baby signing.In fact many of the current teachers of this skill are parents them selves who have embraced the initiative And are keen to encourage and recommend the benefits to other parents. Can Anybody Learn Baby Signing? Absolutely anyone can learn how to baby sign and methods can be learned at home from books, DVDs or on the internet or it is possible that each family can develop their own form if they require. Baby signing is a method of developing and embracing communication techniques in young children. It is a form of pre-verbal interaction and communication that is thought to decrease frustration in both the child and carer and encourages personal, social and cerebral development in the child.